In a previous post, I discussed at length the efforts of the International Maritime Organisation (IMO) to reduce air pollution and GHG emissions from the shipping sector and the perceived role of Liquified Natural Gas (LNG) as an alternative fuel. Since most things do not happen in a vacuum, especially when it comes to economics, we also put shipping within the global climate context. I do encourage you to have a scroll through the article as it will give the following lines a better meaning. In this post, I will try to provide a brief answer to the fundamental question of why it took the IMO 20 years to finally develop a GHG strategy and why this highly anticipated, and celebrated, strategy meets the global net zero goal by 2050 only halfway. It is worthwhile exploring the knotty interactions between the stakeholder involved. 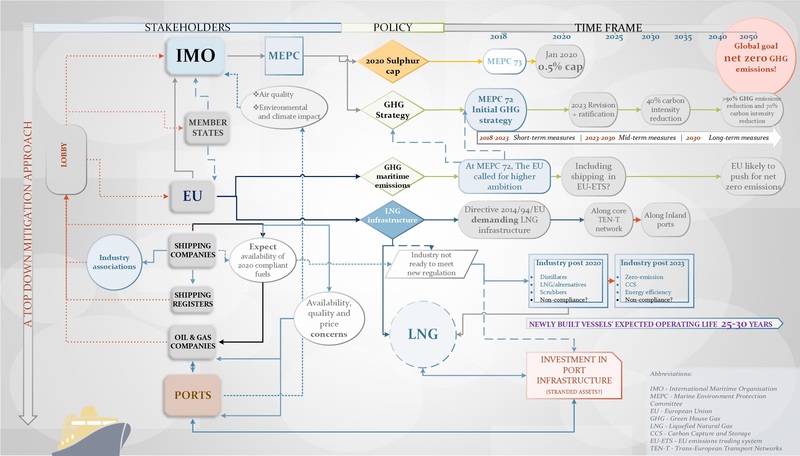 As you could tell from the flowchart below (please do click on it to explore the image in full size), there is a clear top-down mitigation approach, with the IMO seemingly having the final say. The International Maritime Organisation sits in London and works through five main committees. The Marine Environment Protection Committee (MEPC) consists of all member states and is charged with the prevention and regulation of pollution from ships under the MARPOL treaty. At MEPC 70 in 2016, a time frame for the 2020 Sulphur Cap was developed. More recently and after 20 years in the making, the initial Greenhouse gas (GHG) strategy was introduced at MEPC72 in April 2018. A detailed report by InfluenceMap sheds some light on why climate targets at the IMO have taken such a long time to come to fruition by investigating the industry lobby at the Agency. Apart from the few big shipping companies like the Danish A.P. Møller Mærsk (one of the few supporters of higher ambitious GHG reduction and increased transparency) and the Chinese Cosco, the shipping industry remains highly fragmented. Small shipowners keep rather silent on climate-related topics and rely on Industry Associations to protect their interests and act in their best interest at the IMO. The International Chamber of Shipping (ICS), BIMCO and World Shipping Council have all lobbied against pre-2023 measures and binding reduction targets. The ICS representing 80% of the world’s trade fleet is particularly infamous for its strong influence over the IMO not only during the agency’s meetings but also appearing alongside the IMO at official UNFCCC gatherings (including at COP21). Some industry associations, mainly from Scandinavia, including the Swedish Shipowners’ Association and Danish Shipping have been supporting ambitious measures, but their influence is relatively low. Furthermore, the IMO is the only UN agency that allows industry representative to have such an extensive influence at its meetings. The main argument for this is that due to the lack of internal expertise at a governmental level, country delegations frequently rely on the technical knowledge of the private sector to develop and support their position on key policies. Another more sensible explanation of why it took the IMO 20 years to rise to the occasion is the fact that when under the UNFCCC the notion of Common But Differentiated Responsibilities allows developed and developing countries to have variable commitment levels and reduction targets, this is not the case at the IMO. In order to keep a level playing field, regulations apply equally to all member states and to ships operating under their flags. This could also explain why shipping still remains outside of global climate agreements. The EU, acting as the other regulator, has until recently considered including shipping in the EU Emissions Trading Scheme (EU-ETS; similarly to aviation). This was the plan if the IMO failed to firmly address GHG emissions by 2023. And while this intervention is still plausible, as demonstrated during MEPC72-73, the EU has seemingly taken on another important role of pushing for higher targets and concrete short-term measures at the IMO. And when the regulators govern, the 174 member states of the IMO and the still 28 of the EU, each push for their own agenda and a varied level of ambition particularly when it comes to emissions regulation. The EU does indeed continuously lobby for more ambitious GHG targets but at the same time promotes and invests heavily in LNG infrastructure. Under the Alternative Fuel Directive (2014/94/EU) the EU obligates member states to put in place national policies and ensure sufficient LNG bunkering infrastructure is put in place along the core Trans European Transport Network (TEN-T) by 2025, expanding to inland ports no later than 2030. A recent report by UMAS and Transport & Environment does a great job of investigating the impact of the aforementioned directive. Its main conclusion is rather alarming – further incentivizing of LNG infrastructure could cost more than USD22bn by 2050. And when in theory half of the funding should be provided by the EU and member states, the rest has to come from the private sector, including ports. The report goes further by stating that the directive in question should urgently be revised in order to prevent stranded assets and most importantly – to avoid jeopardising the decarbonisation of the shipping sector and the EU’s own climate goals. With the IMO and the EU applying a top-down-approach, regulations are perhaps most strongly felt locally in ports. Compared to shipping companies, ports seem to have less flexibility. They are expected to meet both regulations and industry demands by investing in often permanent and costly infrastructure. Large ports like the Port of Rotterdam have been successfully operating LNG bunkering infrastructure since 2016, but Rotterdam is the biggest port in Europe and will likely see a quick return on its investment as it sets sail to become a major LNG hub. On the other hand, the Port of Esbjerg located in Southwest Denmark has investigated the feasibility of LNG for smaller ports with results showing that if demand does not grow substantially, permanent bunkering infrastructure is economically unfeasible. A less costly alternative could be to supply LNG bunkering via LNG carrier ships or trucks. This however is associated with higher health & safety risks and higher overall GHG emissions (particularly methane leakage). And while Esbjerg anticipates leapfrogging directly to hydrogen, some ports might be required to start putting in place costly LNG bunkering infrastructure, such as those along the core TEN-T network (refer to the map by the EU Commission). The adoption of LNG significantly improves air quality during operation and since most emissions occur close to shore, ports have a certain incentive and seemingly will reap measurable benefits. Nevertheless, LNG only marginally reduces overall GHG emissions when compared to HFO. This somehow does not fit with the call for an unprecedented system and sectoral change if we are to avoid the worst of climate change, nor does it fit with the global goal of net zero GHG emission by 2050. LNG bunkering infrastructure will cost billions. However, if the sector is to meet the long-term shipping and global GHG reduction targets, the strong and timely investment in cleaner alternatives such as hydrogen could make LNG infrastructure redundant as soon as 2025, sending the sector into a downward spiral. Next Next post: Green growth or black decline?